Genes can be mapped in bacteria by taking advantage of transformation, the ability of cells to take up DNA from the environment and incorporate it into their chromosomes through crossing over. The relative rate at which pairs of genes are cotransformed indicates the distance between them: the higher the rate of cotransformation, the closer the genes are on the bacterial chromosome. New phages are released to start the cycle again. ^ The host cell transcribes and translates the phage DNA, producing phage proteins. ^ Phage DNA replicates by using nucleotides from former host DNA. ffi The phage DNA integrates into the bacterial chromosome and becomes a prophage. 8.23 Bacteriophages have two alternating life cycles—lytic and lysogenic. 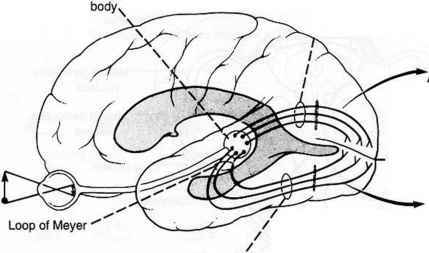 injects its DNA into the cell ( FIGURE 8.23). Once inside the cell, the phage DNA is replicated, transcribed, and translated, producing more phage DNA and phage proteins. New phage particles are assembled from these components. The phages then produce an enzyme that breaks open the cell, releasing the new phages. Virulent phages reproduce strictly through the lytic cycle and always kill their host cells. Temperate phage can utilize either the lytic or the lyso-genic cycle. 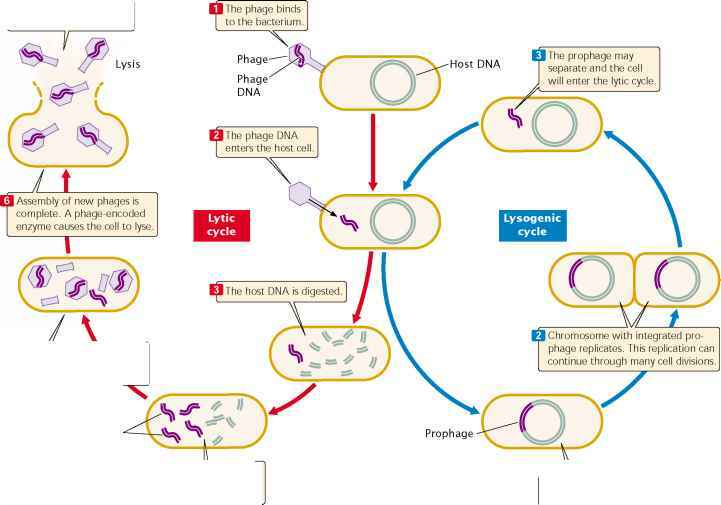 The lysogenic cycle begins like the lytic cycle (see Figure 8.23) but, inside the cell, the phage DNA integrates into the bacterial chromosome, where it remains as an inactive prophage. The prophage is replicated along with the bacterial DNA and is passed on when the bacterium divides. Certain stimuli cause the prophage to dissociate from the bacterial chromosome and enter into the lytic cycle, producing new phage particles and lysing the cell.